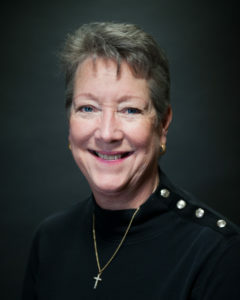 Featured Speaker: Lou Ann Weeks, mosaic artists and cofounder of Skeew.biz, a mosaic supply company thatspecializes in mosaic backers, co-producer of Mosaic Technique Videos, and editor of I-CMosaics.com. How do you know which substrate (backer) is the right one for your project, and what is the right adhesive? There are so many to choose from, and in this webinar, Lou Ann will help you make the right decisions. You’ll learn what criteria to consider before you start mosaicking. She’ll bring it all together and answer your questions during a Q & A period at the end of the webinar. 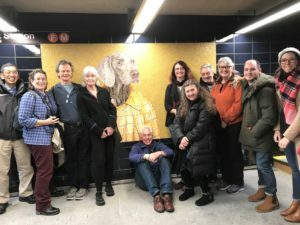 On December 1, 2018, Cathleen Newsham, (a founding member of the New England Mosaic Society), led a private tour for 16 of our members and thier guests of the New York City subway mosaics. 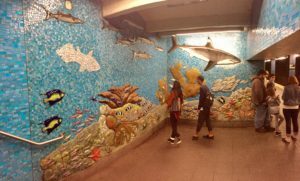 There are over 400 mosaics installed on subway platforms in the five boroughs of New York City, and this tour featured 10 of Cathleen’s favorite sites in the borough of Manhattan. 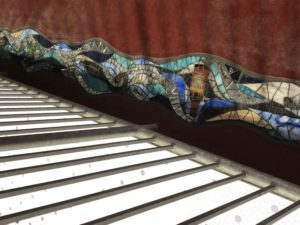 Newsham began her discovery of this immense underground museum eight years ago when a Manhattan family had a dream to create a fantasy Coney Island subway mosaic platform in thier bathroom. 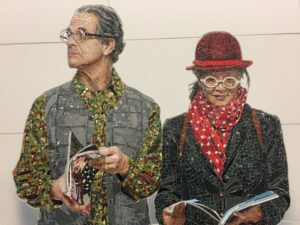 The family commissioned Cathleen to design, fabricate and install it, (complete with the family members in the seats of a roller coaster), which is when she began her research into the NYC subway mosaics. 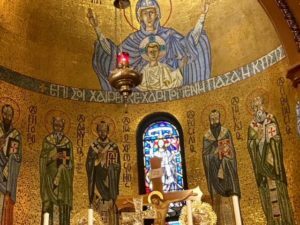 Click here to see the completed mosaic and learn her process. 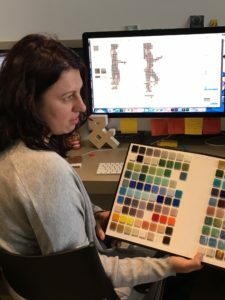 During the design phase of the project, Cathleen began photographing and cataloging these amazing works, which are part of the largest collection of mosaics in North America. 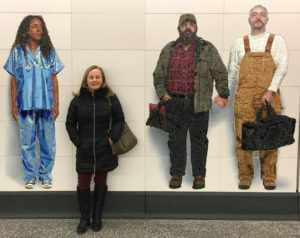 Since then, she has lead many artists, students and enthusiasts through the vast NYC transportation network to view these underappreciated works of art. 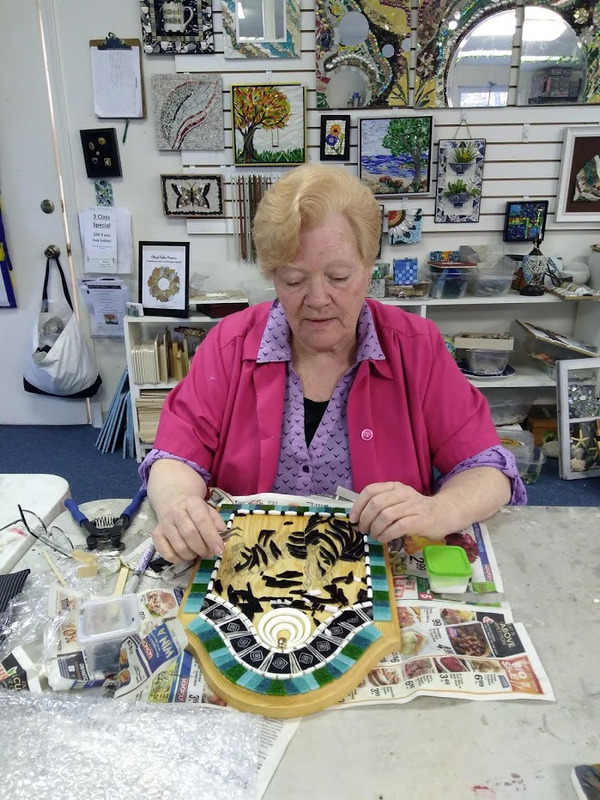 As a professional mosaic artists, she explained to our group the process of how the mosaics are designed, fabricated and installed, and gave participants insight into the complex process of creating a smalti mosaic. Each Quarter we will share member’s art, accomplishments and accolades. Here are some exciting things happening with our members! The artwork will create a beautiful, contemplative focal point for the front of the sanctuary. We are looking for the work to convey a spiritual, inclusive, warm and life-affirming theme with a nod to nature and that is open to the personal interpretation of the viewer. I was eager to comply and thrilled to win the commission as I have been eager to do a public art abstract for some time. The planning process was far more time consuming than my representational style of working. I struggled with the color sketch as when I work abstractly I don’t have a vision in mind when I start the process as I prefer to let the mosaic evolve with regard to use of color. The committee was understanding and I kept them apprised of my progress with photos along the way. 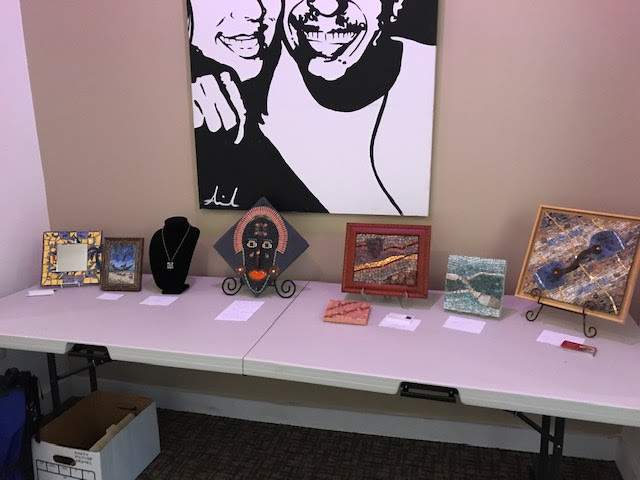 One of the coolest aspects of the final mosaic is the inclusion of donations from the congregation, from a piece of the Berlin Wall to a key to a jewelry box from 40 years ago to an ear mold for a hearing aid. 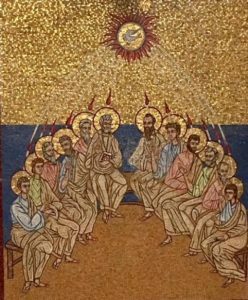 These contributions further the connection between the artwork and church members. 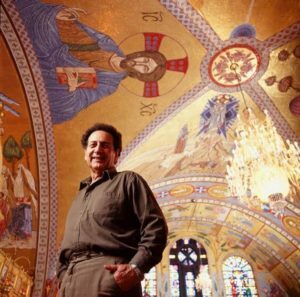 I will be installing the 3 paneled mosaic at the end of November. 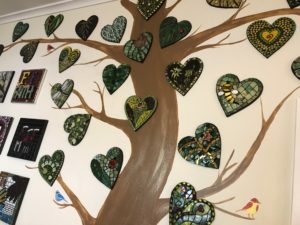 I wanted to share my latest mosaic project with you because it is a tribute to a young man who passed away last year. I got together with people at work who wanted to pay tribute to our friend, Nick, and his mom, Becky. 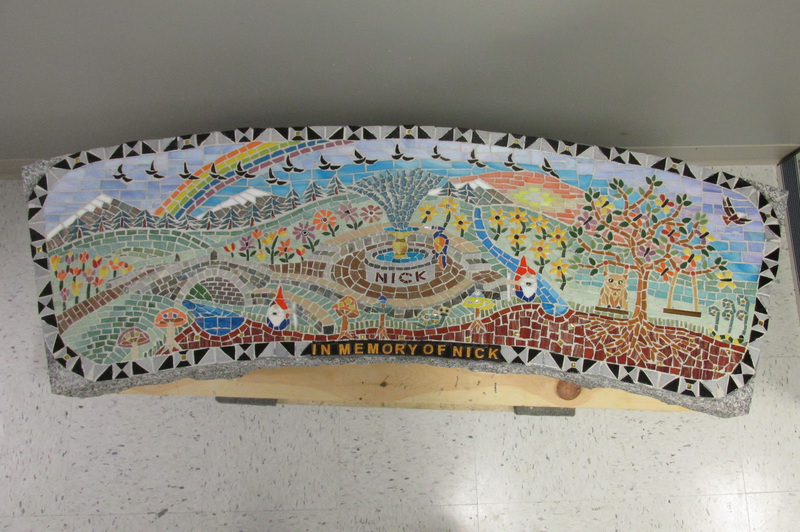 Together we raised money to buy a quality granite bench and I created this mosaic in memory of Nick. I am very proud of this piece mostly because it is a tribute and also a fine gift of art for someone who has lost a child. 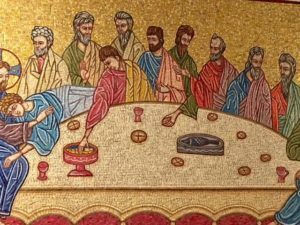 Just thought I’d let you know how impactful mosaic art can be as I am sure you already know. I’d love to do more of these knowing that it can make a difference to a grieving parent who has lost a loved one. 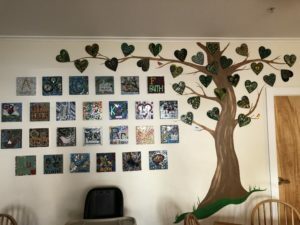 Over 25 people of all ages participated in creating a mosaic mural 5’ x 4’ commissioned by JCOGS -Jewish Community of Greater Stowe, Vermont. Two years in the making, the mosaic finally came together over a two day workshop led by Waitsfield artist Bette Ann Libby. 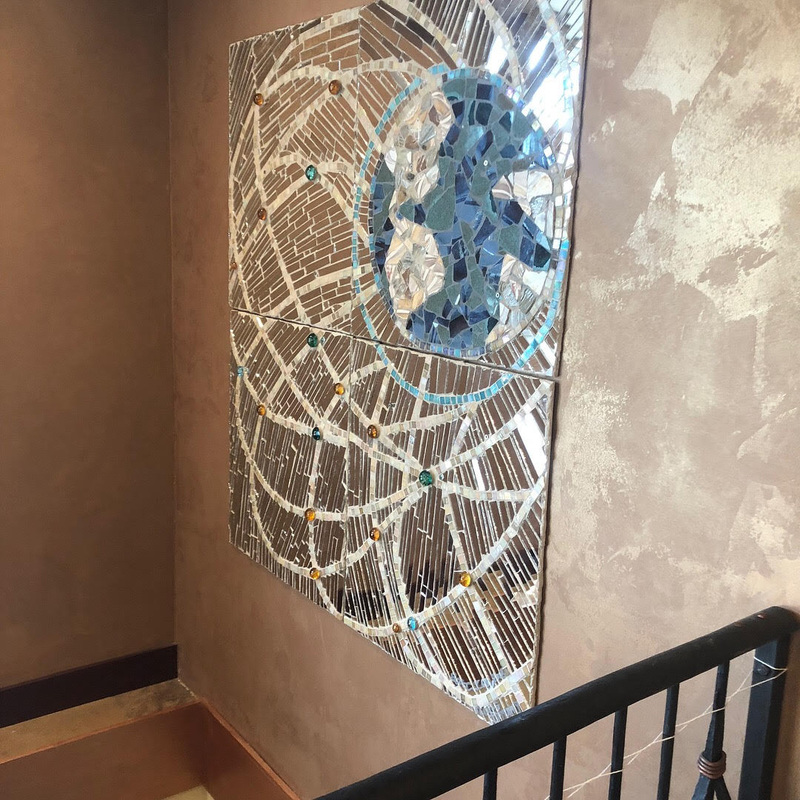 Composed of mirror strips, ceramic shards, and hand blown glass spheres, the image of a world of loving kindness “Olam Chesed”, will hang permanently in the foyer of the Jewish community center!! 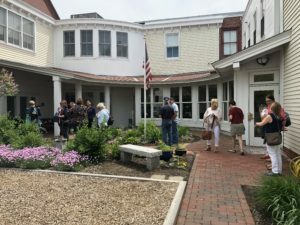 Sally Dean, who is the Education Coordinator at the Art Complex Museum in Duxbury, is designing a 24′ long mosaic to be installed in the sculpture garden at the Art Complex Museum. This project is a part of the Plymouth 2020 Celebration. 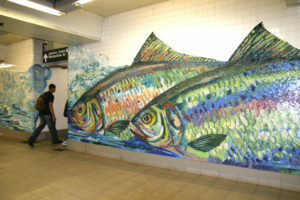 The theme of the mural is herring run, or fish ladder. The herring runs were an important resource for the first Americans. Both Pilgrims and the Wampanoag Tribe used them for food, and the Wampanoag also taught the Pilgrims to fertilize their crops using herring. 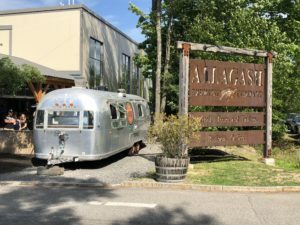 The mosaic will be created vitreous glass, high fired tiles made in our studio and at local Pottery in Norwell, Italian smalti , and natural pebbles. 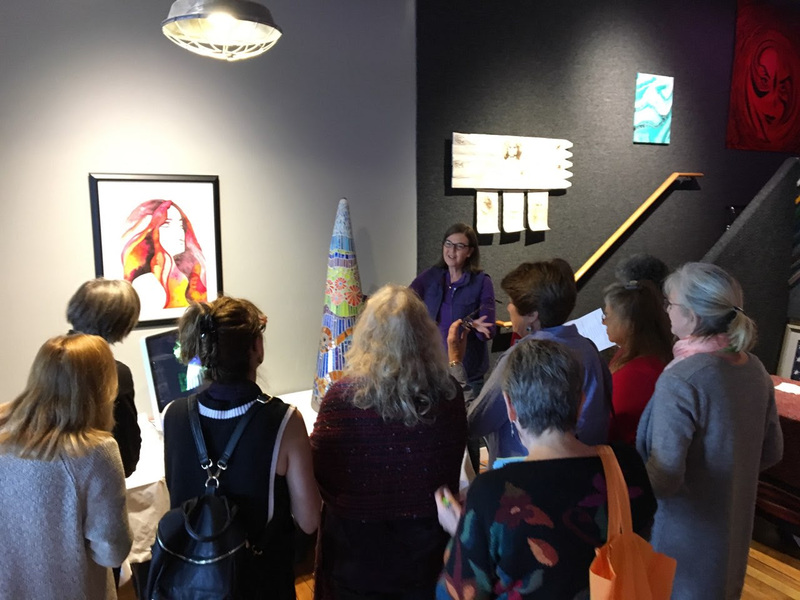 The project, facilitated by Sally, will take place in the Alden studio at several times throughout the year, and visitors will be invited to participate. 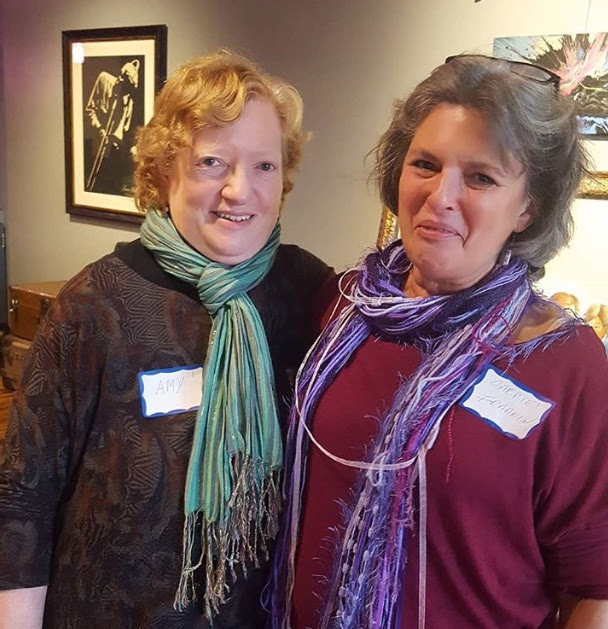 Lisa Houck and Amy Marks are co-producing a holiday Craft market. 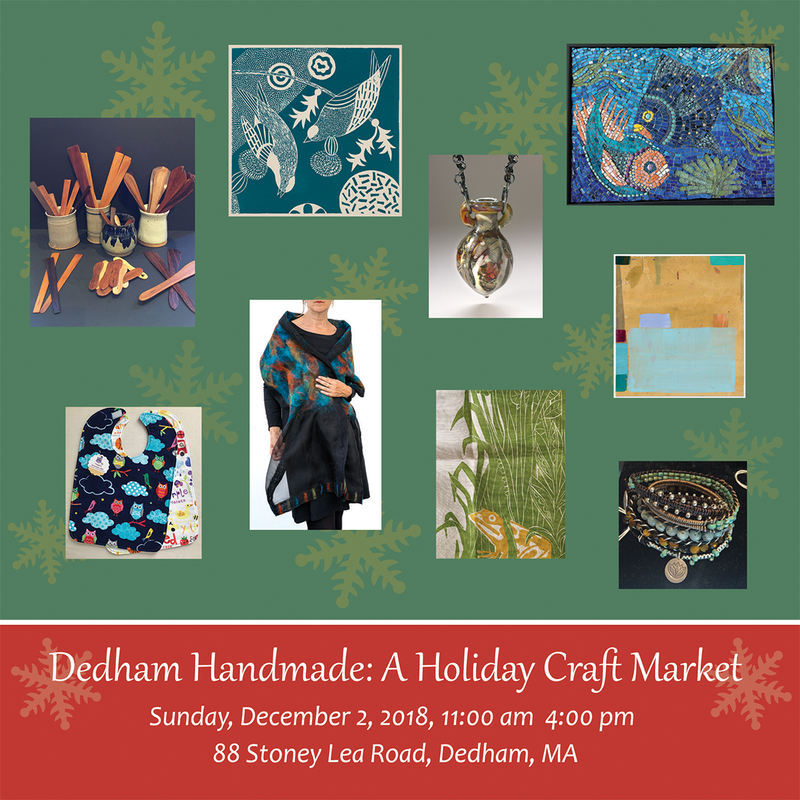 Nine artists will be selling their unique handmade gifts including jewelry, mosaics, prints, collage, functional wooden items, baby bibs, and more. 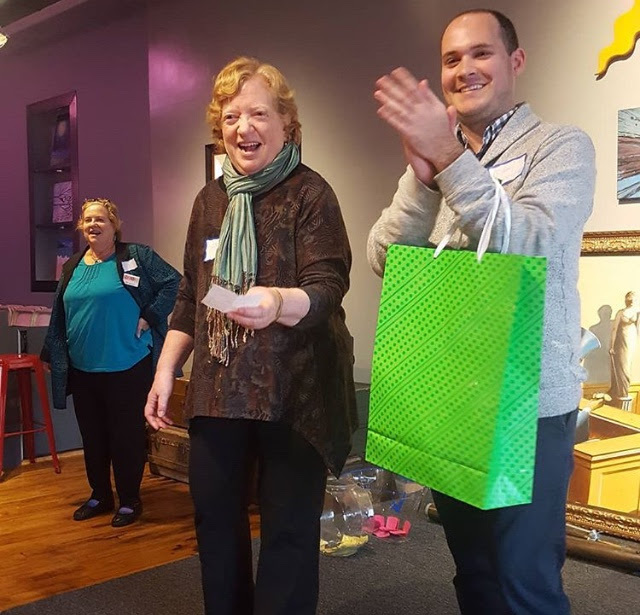 SAMA had a raffle for members who renewed their memberships early and Candace is the Winner of the Orsoni Workship in Venice, Italy! Candace shared her submission for SAMA’s One Hundred + Moments in Mosaic Project with us. 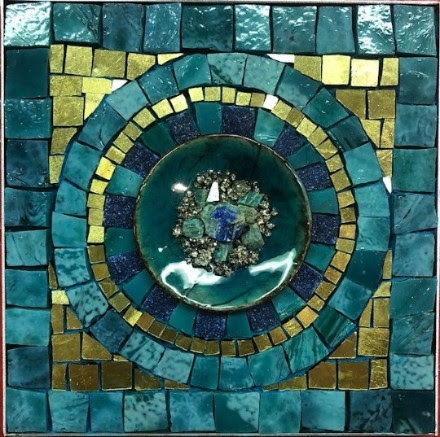 Materials: This mosaic was created using Amazonite, Azurite and Pyrite/Fools Gold set in a small ceramic bowl using Lexel adhesive. Surrounding the bowl, the tesserae are Mexican smalti, Italian gold smalti and hand cut Blu Oltremare stone adhered with colored thinset. 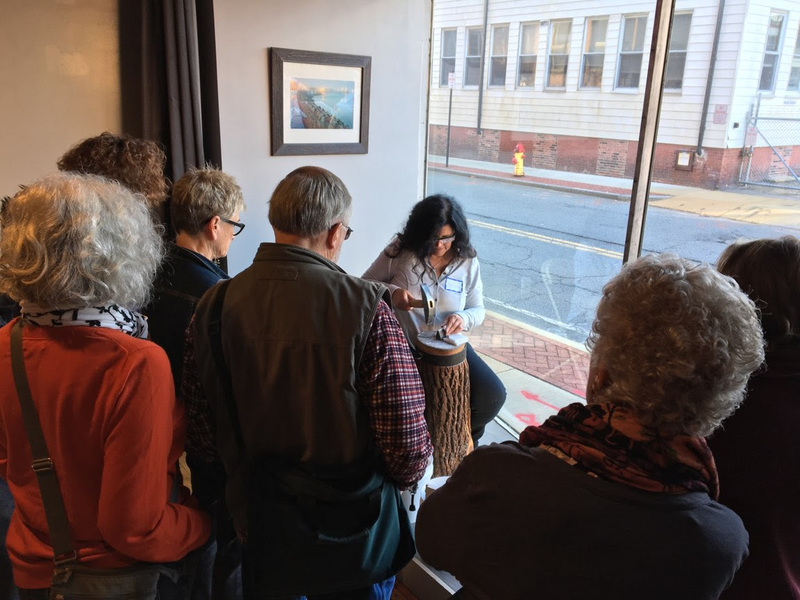 Suzanne Owayda, owner of Mosaic Oasis Studio & Supply taught one session of The Making of Art and Artifacts: History, Material, and Technique at Harvard University to a group of 13 undergraduate students. 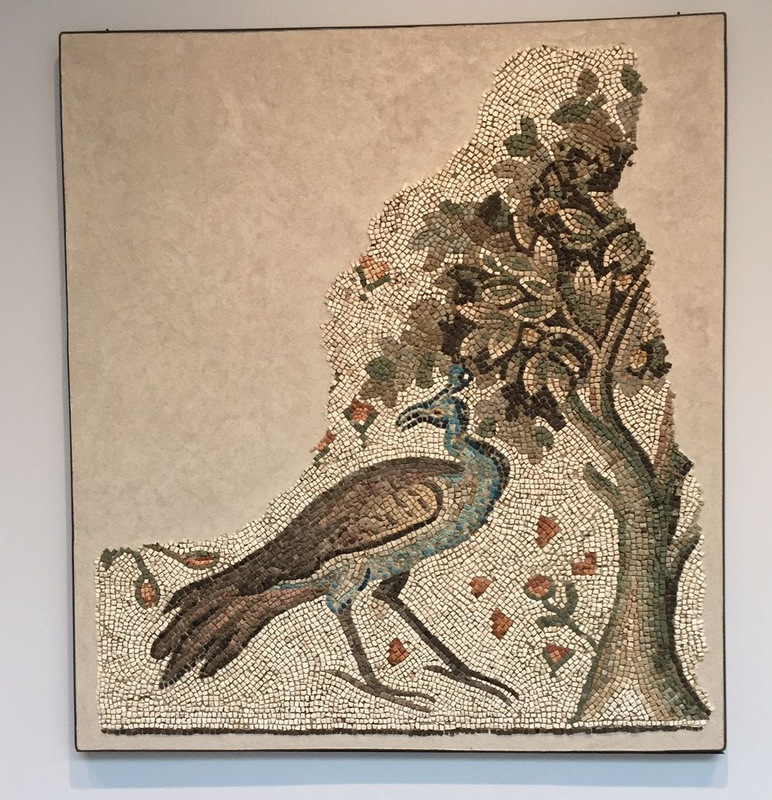 The focus was on a mosaic called Peahen Under a Tree, a mosaic floor fragment found in Syria and made sometime between 500 to 600 AD, it is currently in the Harvard University Art Museum collection. 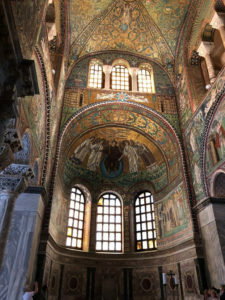 Suzanne gave a short power point presentation about the history and materials used to make mosaics during the Byzantine period. It was a hands on class so the students tried their hand using a hammer and hardie and the whole class recreated the mosaic (see the actual and the student representation) using stone and smalti glass. 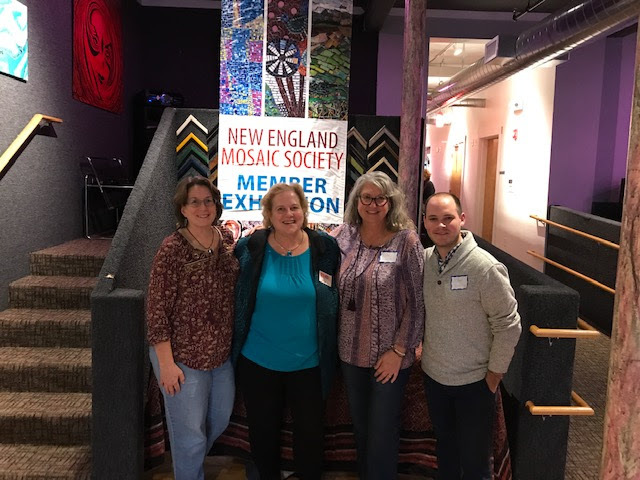 Suzanne also showed images of modern mosaics using the ancient materials by NEMS mosaic artists and members, Cathleen Newsham, Pam Stratton, Deb Aldo, and Cynthia Fisher. The students did a fabulous job recreating the mosaic and Suzanne was relieved that no one smashed a thumb using the hammer! 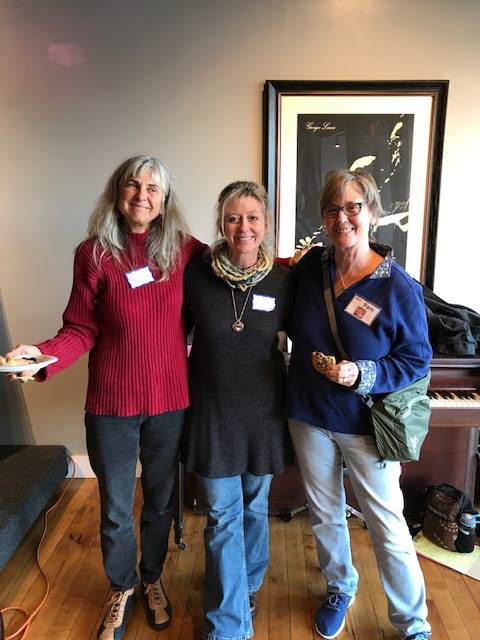 Our annual meeting was held on 11/4/18 at Patterson Creations in Attleboro MA. Thanks to those who were able to make it and a special Thanks to all who volunteered their time to make the event a fun educational day! Michael Ferriera started off the meeting with the business news, and from there we went into our presentations. Cindy Fisher, Pam Stratton and Nikki Sullivan discussed the process they used for jurying the Somerville show. From there, we heard Anabella Wewer’s talk about What is Not Andamento, then we wrapped up presentations with Ouiji Morris and Michael Ferriera talking about Art Activism. All the talks were interesting and informative. After a break we moved on to demonstrations. Laurie Frazier brought a piece of art and a video on her installation and talked about how she made it. 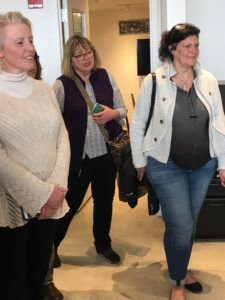 Cathleen Newsham did a demo with a Taurus ring saw and Anabella Wewer did a demo of cutting various materials with Hammer and Hardie. We did a material swap and had time to view various artwork brought by members for display. It was a full day that ended with some very happy raffle winners! 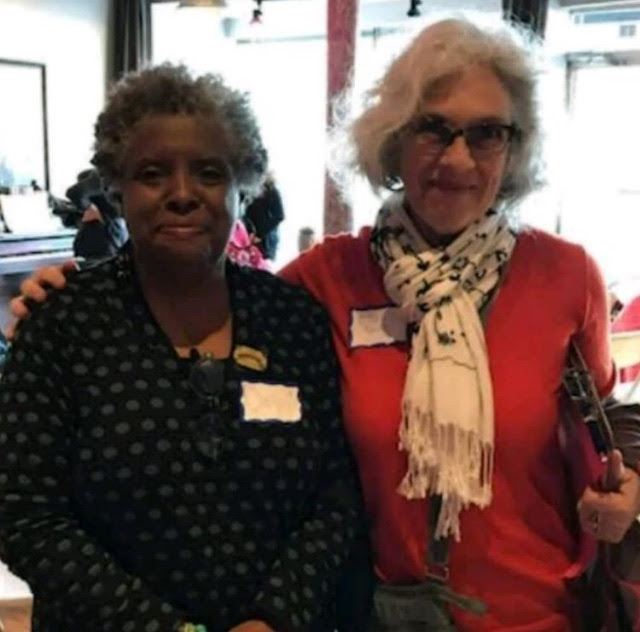 Carrie Fradkin won the Sherri Warner Hunter workshop gift certificate along with about $300.00 from the 50/50 raffle, Ouiji Morris was the winner of the SAMA Registration or Gift Card to Wits End (she chose the Wits End Gift Card). In addition, Patterson Creations donated 2 bottles of wine to raffle, congratulations to to Cecelia Kramer and Ruth Faris as the winners. The Executive Team wants to once again thank everyone who came and helped out, it was a successful day and we could not have done it without you all! We are looking forward to planning an even better meeting for next year! 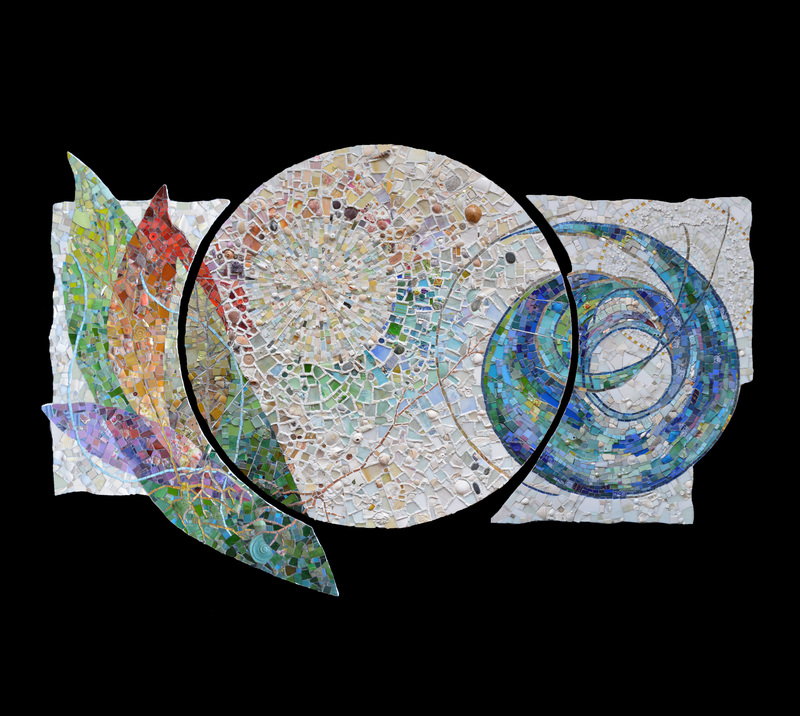 How did you get started in mosaic art? About 11 years ago, my partner and I made a 25’x25’ brick patio of intersecting concentric circles that was inspired by all the beautiful piazzas in Italy. The center of each circle was a 8 inch circle that we needed to do something with. We placed pieces of brick and stone in the cement filled Sonotube slices to make small mosaics of our favorite things and places. That got me going. I then found a class that met once a week at Mass Art in Boston and made my first mosaic. 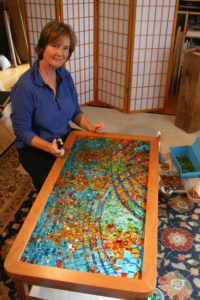 But what really got me excited about mosaic art was Lynn Moore at Mosaic Smalti. After her class I made my Sunflower mosaic. I met Bill Buckingham and Michael Welch at a Cambridge mosaic show and tell where I brought my sunflower mosaic, that was also inspired by that same trip to Italy. Bill loved it and It became the cover for the catalog of the first Somerville Mosaic Exhibition. The rest is history. Wanting to create art for outside was my original inspiration. I am coming back to that now. 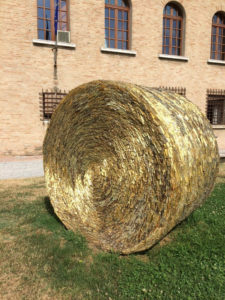 I love the Spilimbergo Style. Currently I am enthralled with Dino Maccini’s work. I am a texture person. I like smalti and stone. I find the natural hues of stone and the bling of smalti pair really well. As a kid, I had a rock collection and always found geology interesting. I love fossils. I have started playing with encaustic wax and cold wax and oil paint in my mosaic work. I aspire to create abstract art integrating these materials and techniques. Let yourself play! My best work seems to come from letting myself be free and experimenting. Mosaic was what made sense for outdoor art. I enjoy a beautiful yard and the hands on physical making of the art. I find the process meditative. Meeting Dagmar Friedrich in Spilimbergo Italy and learning the lime plaster technique. 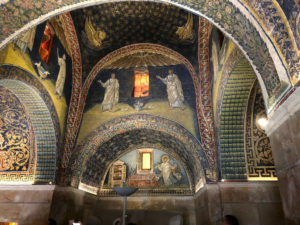 I really like open quiet space in a mosaic, the old world feeling it can give or the totally modern effect it can also create. I am working with some hand made bark paper and encaustic wax with stone. I also have the challenge of integrating mosaic into a tree I am having carved into a sculpture in my yard. 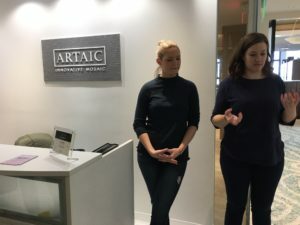 NEMS members recently participated in an exclusive tour of Artaic, a company located in the Seaport’s Design Center. 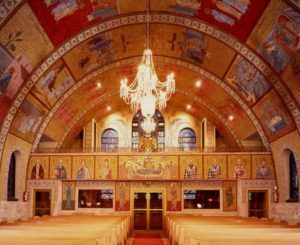 Artaic uses design software and robotic mosaic assembly systems to fabricate large custom architectural mosaics very quickly. We had a lively discussion with Founder & CEO, Ted Acworth who discussed how the firm came to be and how it sources suppliers. He described several of the projects they’ve fabricated and was interested in feedback on how the software could benefit mosaic artists. 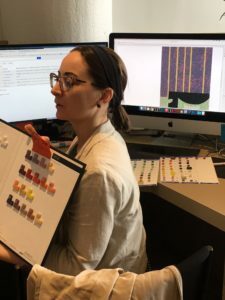 Graphic designers showed us how to use the software to visualize and manipulate an original piece of artwork, illustration or photo into a mosaic and how that mosaic will look using different materials and grout colors. 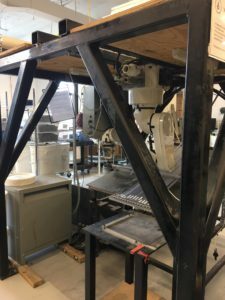 Then, we took a tour of the robotic assembly system. 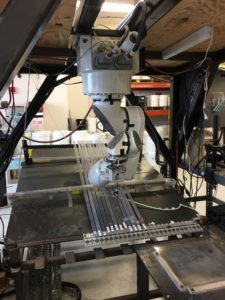 Mosaic tile is loaded into sleeves and the software tells the robot where to place each tesserae in a square foot frame. Ted makes the software available to artists for free. You can check it out at www.artaic.com/tylist.